In our continuous search for the dazzle of the complex, the beauty in simplicity is often dismissed or overlooked. 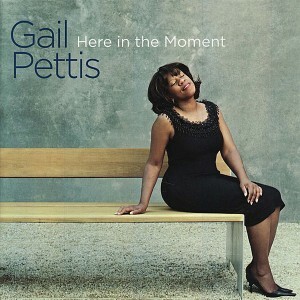 Such is the case with Gail Pettis, an unlikely addition to the vocal jazz pantheon (having spent three decades as an orthodontist before turning her attention to singing), but a very welcome latecomer. With the 2007 release of her debut album, the flute-voiced Seattleite demonstrated a fine interpretive gift, one that hugged tightly to the melody while enhancing the lyricists’ intents in gently persuasive ways. Pettis follows the same, slightly curvaceous path through Here in the Moment, simultaneously maintaining a retro air that hints at the silken sophistication and storytelling elan of the young Nancy Wilson. Consider, for example, her “At Last”, every bit as sexily jubilant as Eta James’, yet unfolded on soft waves of contentment rather than ecstatic wails of satisfaction. Then there’s her “I Could Have Danced All Night”, its exultant joy contained within easy, dreamy swirls, and a “Nature Boy” with its inherent mysteriousness enticingly enhanced by a lightly heated salsa beat. Best indicative of Pettis” sly integrity is, however, her “How Did He Look?”, stripped of the overt pain with which so many others have painted it and instead shaped as a casual conversation with a trusted friend, the deep heartache bleeding through her facade of nonchalance.